- Cave exploration otherwise known as Spelunking, I believe is one of the undiscovered sports that should be promoted here in the island. Westside of Libjo is made of limestone type of rocks with lots of caves, clefts, stalactite, stalagmite and rock island formation. There could still be more caves out there unnoticed and worth to be explored. 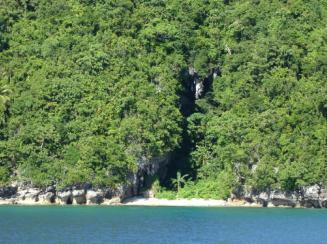 One of the caves close to barangay Quezon is so large that it was used as a refuge during the war of WorldWar II. It was also used as burial site for centuries and until now you can still see piles of human bones. Ritual rites for quack doctors and spirit offerings were also done in some of this caves. - Mountain Climbing Mt. Pelhi. Reaching the heights and experience the cold mist next to the clouds is one of my favorites. Catching your breath as you climb, Mt. Pelhi in the east side of the island is one of its kinds. Trees grow shorter as it reaches the top. I suggest this place should be called the bonsai garden. Everything looks short and you will really notice it’s a whole new world up there. More on Mt. Pelhi. - Snorkeling and Scuba diving depends on what you looking for. Some spots I believe still can be access for wrecked diving. World War II brings some of this airplanes and ships in this face of the ocean. Coral reef can still be considered intact since creation. And a spot is still possible to whale shark watching. - Biking – with all kinds of terrain and no rules to follow. This could be a haven for all kinds of bike enthusiast. Design to transport lumber during timber cutting period, trails can be access by motor or by pedal. - Canoeing, fishing and island hopping is not a problem at all. Libjo is situated next to the ocean. And this place is made from bay, rivers, swamps, islands and fine white beaches. - Rock climbing (Libjo Rocks) the walls surrounds the rock formation along the ocean is one of finest in the country. - And there could be more! Weather that is all year round free from snow and cold. This could be a paradise. It's actually not just a comment for this scetion but the website as a whole...obviously done with extra care and so much dedication, I have yet to visit Libjo as a tourist-i was there ages ago as a very young girl when we did an outreach activity for the typhoon Nitang.Keep up the good work and more power. It depends on what San Jose you're talking about. If SanJose gamay in Libjo..yes it is located next to SanJose river... a fresh water. But if you are looking for fishing why not ocean fish or salt water fish?